Firing on the First World War’s Western Front ended on Nov. 11, 1918 at “the eleventh hour on the 11th day of the 11th month.” Thousands of Americans served in this war both at home and abroad and many lives were lost. As the centennial of Armistice Day is commemorated, I can’t help but remember the friends and family of Maud Hart Lovelace who were touched by this war. Delos Lovelace (Joe Willard) was in First Officers Training Camp and stationed at Fort Snelling when he met Maud Hart (Betsy Ray) in 1917. Just six months later, on November 29, 1917, the couple was married while Delos was on a weekend pass from Camp Dodge, Iowa. Delos was sent to France as a 2nd Lieutenant in the 339th machine gun battalion. When the war ended, the Army sent him to Trinity College in Cambridge for four months of study while he waited for space on a troopship to come home. Charles Harris (Jack Dunhill), husband of Marjorie Gerlach (Tib Muller) enlisted in the U.S. Army at the beginning of the war and served as a sergeant in Company C of the 212th Engineers. Myron Wilcox (Jed Wakeman) served in Chaumont, Dordogne, and Aquitaine, France. He was a 1st Lieutenant Infantry on General Pershing’s staff in Chaumont, France. It’s unknown if he and Marguerite knew each other at that time they were serving in France. Myron and Marguerite were married in 1923. William Everett (Sam Hutchinson), husband of Marion Willard (Carney Sibley), was ordered to active duty as a first lieutenant in the Aviation Section in August 1917. After training, he was sent to France with an aero squadron in January 1918. He and Marion were married a month after he returned home in August 1919. Tom Fox (Tom Slade) attended West Point in 1915. His classmates were Dwight D. Eisenhower and Omar Bradley. Tom had a lifelong career in the military. He died in 1955 and is buried in Golden Gate National Cemetery in San Bruno, CA. James Baker Jr. (E. Lloyd Harrington) was overseas serving in the Norton-Hordjes ambulance corps and he later became a lieutenant in the French military. The war interrupted and changed the course of the lives of these young men and women as it did for thousands of others. 100 years later…we remember…and continue to pray for peace. Never forget. Writing would bring Maud Hart and Delos Lovelace together, with a little help from a matchmaker. That matchmaker was Lillian Wakefield. In 1915, Delos Lovelace began working as a reporter for his good friend Harry Wakefield, the city editor of the Minneapolis Tribune. 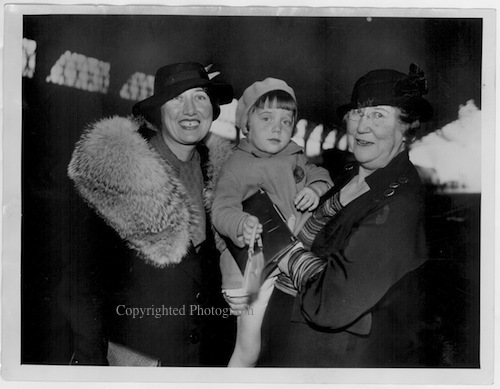 The following year, Wakefield’s wife Lillian opened the Wakefield Publicity Bureau in Minneapolis. At some point Harry steered Delos to his wife’s office. In the spring of 1917, Delos left the publicity bureau to join the First Officer’s Training Camp at Fort Snelling. In a 1974 interview with Jo Anne Ray, Maud told her, “Mrs. Wakefield was a great matchmaker, and she invited Delos, myself, and Helen [Maud’s sister] to dinner at her home – I think she invited Helen because she was young enough not to give any competition. Well, we had a lovely time Delos and I were seated across from each other and we kept eyeing each other. I remember we walked Helen home and then Delos and I walked and walked, around the lakes, and talked and talked – it was practically dawn before we reached my home. After that, whenever possible, Mrs. Wakefield would send me on assignments out to Fort Snelling,” where Delos was stationed. This first meeting between Maud and Delos was in April 1917. They were married on November 29, 1917. When they wed, their combined names sounded even more “like a valentine”. Maud dedicated Betsy’s Wedding to Lillian Hammons Wakefield, the matchmaker who brought her and Delos together. The fictional names Maud gave to the Wakefields were Bradford and Eleanor Hawthorne. 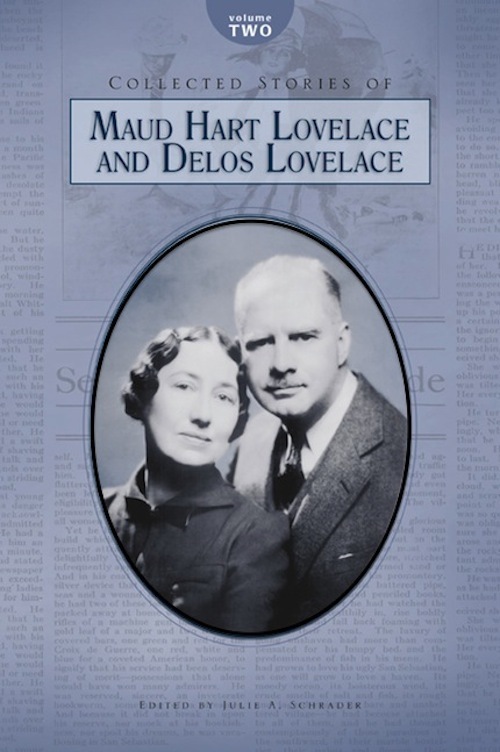 Start the New Year reading the second volume of Collected Stories of Maud Hart Lovelace and Delos Lovelace. The new volume is a collection of 18 published short stories. The couple, independently and collaboratively, wrote and sold hundreds of short stories in their early careers. The stories in this volume show their early talent as writers. The book offers a fascinating series of short stories to read, including Maud’s first published short story, Number Eight: A Startling Adventure On A Midnight Car. Number Eight is a story about a late night ride on a city street car one cold November evening. Friends Amy and Gertrude, along with their chaperone Mr. Morley, board a street car for the ride home after an evening of dinner and the theater. “I do not know how many hours it took us to return home, but well I remember the terrors of that wild wind. My mind was harrowed with doubt and fear, and in the murky darkness I seemed to see ever dancing before me the evil eyes of the man we had left on Number Eight.” The next morning when they read the newspaper headline, Amy and Gertrude understand what happened aboard the street car they had ridden the night before. “Find out what flowers she wants for her bouquet,” called Paige. “Anything, and forget-me-nots,” said Betsy. “If Betsy wants them, I’ll find them,” Joe replied. Betsy opened the box quickly, and he had found forget-me-nots! Blue and reassuring, they were scattered among pink roses above a shower of white satin ribbons. Tacy went upstairs, and Betsy followed. She paused above the platform. Tib, Margaret, little Sally Day, and some girl cousins gathered expectantly below. Betsy took a forget-me-not out of her bouquet and tucked it into her dress. Then the bouquet sailed down, ribbons streaming, and Sally Day caught it and jumped up and down with joy. Maud Hart Lovelace (Betsy) has not been forgotten as is evidenced by the many fans who continue to buy her books, visit Deep Valley and the Betsy-Tacy houses and join the Betsy-Tacy Society and the Maud Hart Lovelace Society. Her books are timeless and loved by people of all ages. The Ladies Home Journal, the oldest women’s-interest magazine in the U.S., ended its regular monthly publication this month. 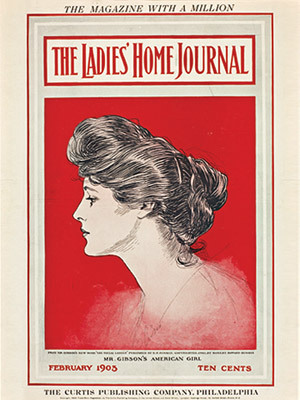 For the past 131 years Ladies’ Home Journal has served as a chronicler of American life in its glories and challenges, through world wars and cultural earthquakes, all through the lens of a woman’s ever-shifting experience and perspective.” Quote from the Ladies Home Journal website. Delos Lovelace’s short story, Wheat, was published in the July 1924 issue of The Ladies Home Journal. The Delineator magazine published Maud’s short story, Little White Lamb, in its June 1924 issue. This story is included in the book I edited and published in 2012, Collected Stories of Maud Hart Lovelace and Delos Lovelace. To date I have been unable to locate Maud’s three short stories that were published in the Ladies Home Journal in 1924. If any one has these and is willing to share, please let me know. Volume 2 of Collected Stories of Maud Hart Lovelace and Delos Lovelace is due to be released in the fall of 2014. Details will be announced later this summer. 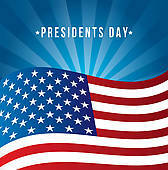 Today we celebrate Presidents’ Day, commemorating the birthdays of President George Washington and President Abraham Lincoln. I’m reminded of how Betsy’s little sister Margaret wanted to celebrate Washington and Lincoln’s birthdays—with a party for her cat, Washington and her dog, Abie! Margaret didn’t want a lot of people at the party, just Betsy. She decided to pick a day in between Lincoln’s and Washington’s birthday, just so “neither one’s feelings were hurt”. They chose February 18th for the party. Betsy and Margaret planned to make place cards by drawing pictures of cats and dogs or cutting them out of magazines and pasting them on cards. “We mustn’t let Abie and Washington see us making them, though. We want them for a surprise. And when the day comes we’ll brush Washington and Abie and tie ribbons into their collars.” Betsy said. “Washington looks best in pink and Abie in blue…” Margaret said. The girls decided to serve creamed salmon on toast. Of course the party didn’t turn out quite as planned. But it was the thought that counts. 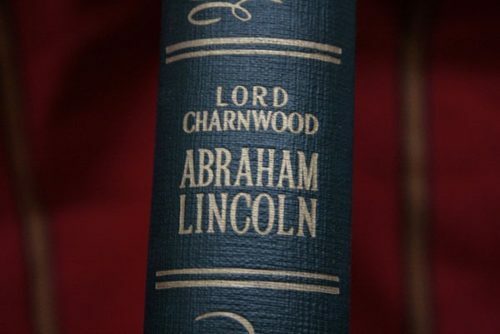 On another note…in an interesting article from the Wall Street Journal (Feb. 14, 2014) The Biography He Deserved, Joseph Epstein writes about Lord Charnwood’s biography, Abraham Lincoln. According to Epstein this book is the best of all books written about Lincoln. Read the entire article. “You were eating an apple and reading a book, the first time I saw you,” [Betsy] reminded Joe one night, when he put down Charnwood’s Abraham Lincoln to go to the kitchen for an apple. Charnwood’s biography was first published in 1916 and was a new book at the time Maud and Delos were married in November 1917. It’s very likely a book that they would have read. In One Stayed at Welcome, Maud describes a historical celebration through the eyes of her characters, Dan and Larry. It was in 1854 that construction began on the first permanent bridge to span the Mississippi River at any point along its length. The site chosen for the bridge was located just above St. Anthony Falls and linked the fledgling towns of St. Anthony and Minneapolis. Native Americans had forded the river here and later Franklin Steel operated a private ferry service at this location. Construction was completed in late 1854 and a grand opening celebration was planned for January 23, 1855. The cost of the bridge was reported to be $36,000. The opening of the bridge was celebrated with a gala celebration featuring a mile-long procession with 100 cutters, sleighs and bobsleds, followed by a banquet at the St. Charles Hotel. The First Suspension Bridge across the Mississippi River in Minneapolis, ca. 1868. Suspended from four shingled towers, two on the Minneapolis shore, two on Nicollet Island, this lifted its lacelike wires against the blue wintery sky. Standing there it holds the proud character of being the first bridge structure of any kind to be flung across the mighty Mississippi. The bridge was 620 feet long and 17 feet wide, with wire suspension cables running over wood-shingled towers on stone bases and anchored by cast iron moorings placed below the limestone bedrock. The stone bases of the towers on the west side of the river were excavated and stabilized in 2001-2002 and are now visible as part of First Bridge Park (located at the site of the original bridge). Maud’s historically accurate descriptions of the grand festivities, the parade and the banquet in the book bring the period to life! Quotes in italics from One Stayed at Welcome by Maud and Delos Lovelace. 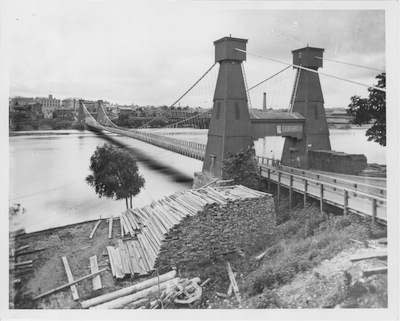 First Suspension Bridge linking St. Anthony and Minneapolis. In planning their first novel collaboration, Maud and Delos chose the period of the 1850s and 1860s, the early years of Minnesota statehood. Maud said that the location for the fictional village of Welcome is somewhere between Bloomington and Chaska, MN. She did all the research for the book, spending a great deal of time in the library of the Minnesota Historical Society gathering information about the history of the Hennepin County area. Delos did the plotting. Many historical places and events are threads woven into the fictional story of One Stayed at Welcome. The Lovelaces didn’t change the real names of the historical figures and places in the book, but the character names are fictionalized. 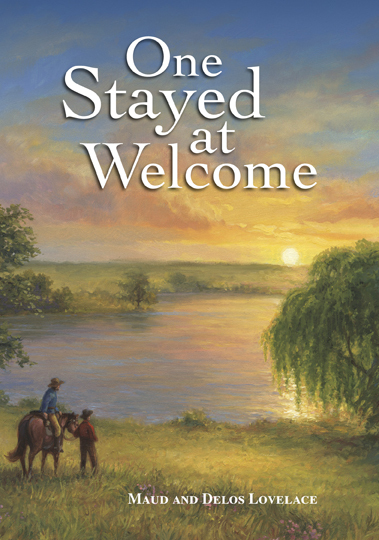 In their new book, One Stayed at Welcome, the authors tell the story of this section of the state as it was in the more adventurous days of the ‘50s and early ‘60s. Those were the days when a little town called St. Paul was rivaling another village called St. Anthony and there was no Minneapolis. From a background of careful research into the story of that period, the authors have written of names and places prominent in the development of Minnesota and Minneapolis. Definitely, the locale of the new book is the prairie edging, a small Hennepin county lake near the Minnesota River. Lake and town were named Welcome by the two boys who staked out their claims and started the little settlement which has since been absorbed. An engrossing romance, this new novel from the pens of two gifted former Minneapolitans teems with adventures of the pioneers who settled our northwest. Its originality lies in its new approach to the frontier story. It gives us the thrills, the charm, the color, in lieu of the more commonplace tale of struggles and hardship. The following was written by Merian Kirchner (daughter of Maud & Delos Lovelace) for the 1992 Betsy-Tacy Society newsletter. I can tell you about our Lovelace family Christmas tree. It was always beautiful and I imagine some of the ornaments came from Minneapolis and before that, Mankato. They were mostly the classic blown glass kind, red and green and blue and white and silver and gold. Balls of all sizes, of course, and all kinds of other shapes and designs…Santa and bells and pinecones and houses and lanterns and musical instruments and birds, and, and, and! When Bert and I got married, we started our own collection, all gold and silver and white, because that was what his family had in Germany and I wanted to keep the Kirchner traditions as well as Lovelace ones. Along the way, we acquired just two Lovelace ornaments, I can’t remember how. A little silver house with colored windows, and a beautiful red and blue bird with a horsehair tail. The bird is our tree top ornament, because we never found an angel or a star that seemed quite right for the top. Betsy-Tacy people may be pleased to know that our Lovelace Christmases were very Hart/Rayish. We read about the Cratchits’ Christmas dinner, and The Night Before Christmas, and the birth of Jesus from the book of Luke, and Grandma Stella (who came to live with us when I was about four) played the piano for carols. We had oyster stew for supper on Christmas Eve, and sausages for breakfast on Christmas morning, and turkey with all the trimmings for Christmas dinner, followed in the evening by turkey sandwiches with cold stuffing on them. Just like the Rays on High Street, we split up for church after we opened our presents on Christmas morning – Baptist for Stella, Episcopal for Maud and Delos and Merian. Our tree never went up until the 24th. When I was very small, Maud and Delos trimmed it after I went to bed and I didn’t see it until Christmas morning. But even after I was old enough to help, and knew for sure that there really was a tree waiting in the living room, coming downstairs in the morning was magic. The colored lights were reflected on the ceiling, mingled and softened to near pastel, and that pool of blue and green and rose was the first thing I saw. In this Christmastide, I’m wishing with Tiny Tim: God bless us every one!